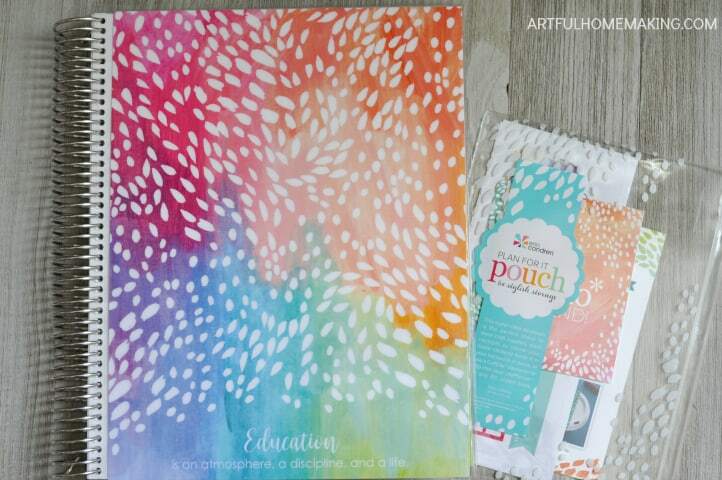 When my Erin Condren Homeschool Teacher Lesson Planner comes in the mail, I feel like I’ve just received a gift! 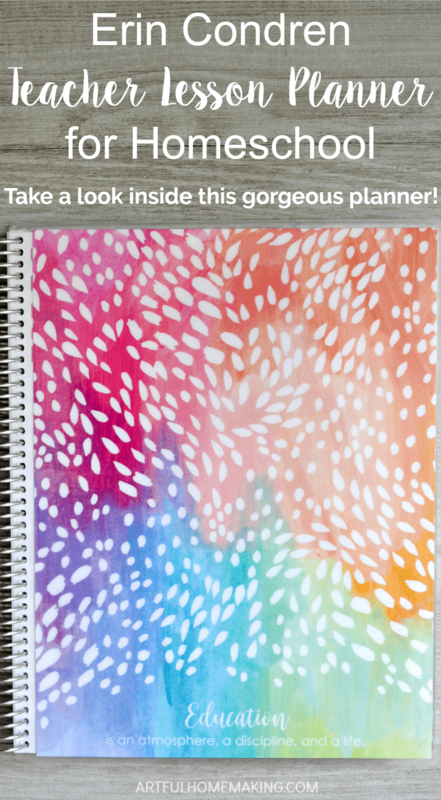 Would you like to see inside this gorgeous planner? This is my second year using this planner (see last year’s review here), and I’m even more thrilled with it this year! It’s absolutely beautiful! There are so many different cover designs to choose from, but I tend to go for the watercolor ones. The Painted Petals design is my favorite cover ever. When I saw it in the lineup, it only took me a couple of seconds to know it was the one for me. 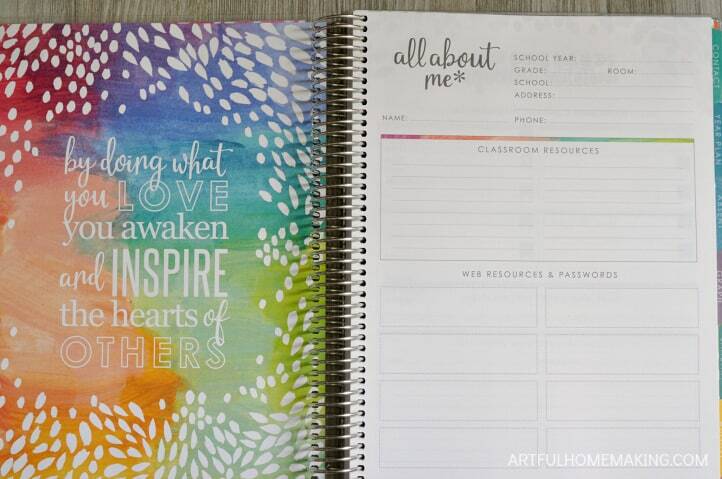 When you order your planner, you have the option to personalize the front with whatever you want. This year I chose the same Charlotte Mason quote that I used last year. I just find it inspiring, so I thought I’d repeat it! 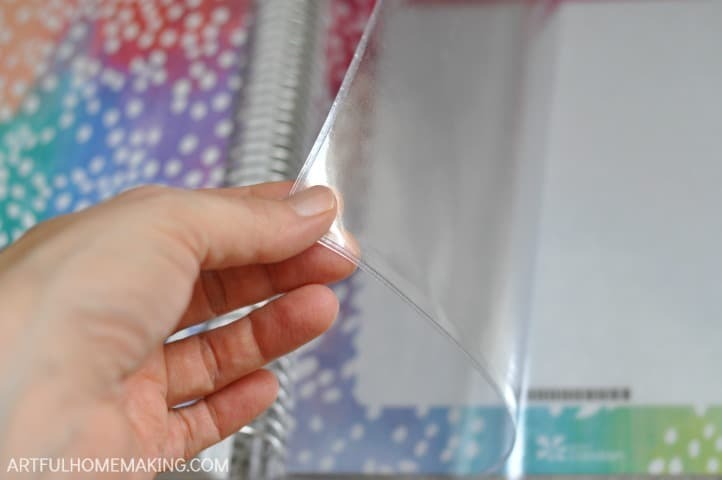 When you open the front of the planner, the inside front cover is also laminated, which is really an awesome feature, since you can write on it! You can keep all sorts of lists and reminders here, like memory work, notes to yourself, or anything that would be useful to you. 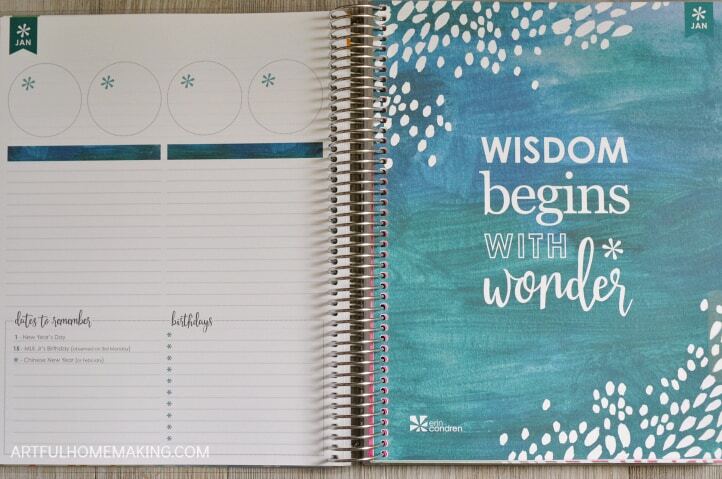 You can use a wet-erase marker (Erin Condren sells these), but I prefer to use an ultra-fine point Sharpie permanent marker, as it doesn’t erase as easily. The next two pages aren’t very useful for homeschoolers. However, there are lots of ways you can modify them to make them work for you! The next two pages are new this year. They’re designed to be a communication log, which would be useful for school teachers (and not very useful for homeschoolers). However, I was able to make great use of these pages with stickers and new headings! Next, we come to the Year Plan pages. These are very useful just the way they are, and I love all the bright colors! This is a great place to plan ahead for dates to remember, seasonal art and book plans, etc. At first glance, these “Absentee Log” pages seem like they won’t be helpful, but I was able to transform them into something useful for us! This is a great place for a book list, a list of memory work, or any other kind of list you might need to make. 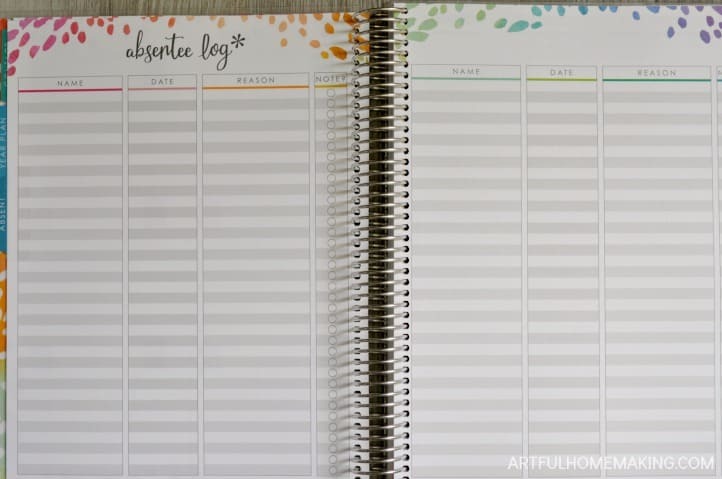 The last pages before the calendar section are graph pages, perfect for all sorts of uses. Next come the monthly calendar pages. 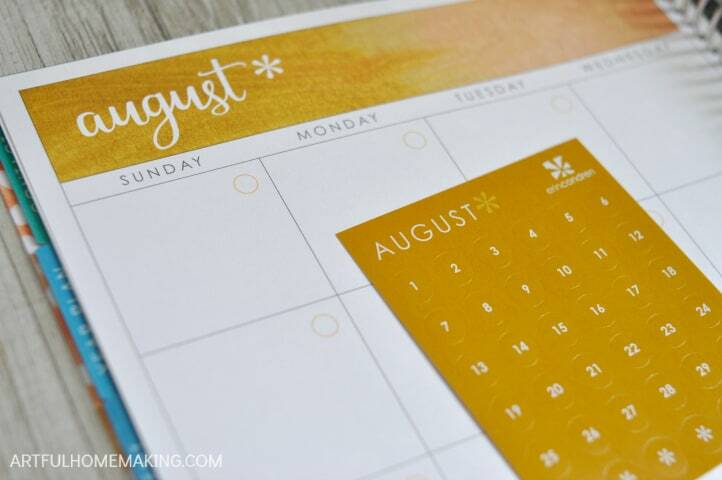 Since this is a school planner, my calendar pages start with August. 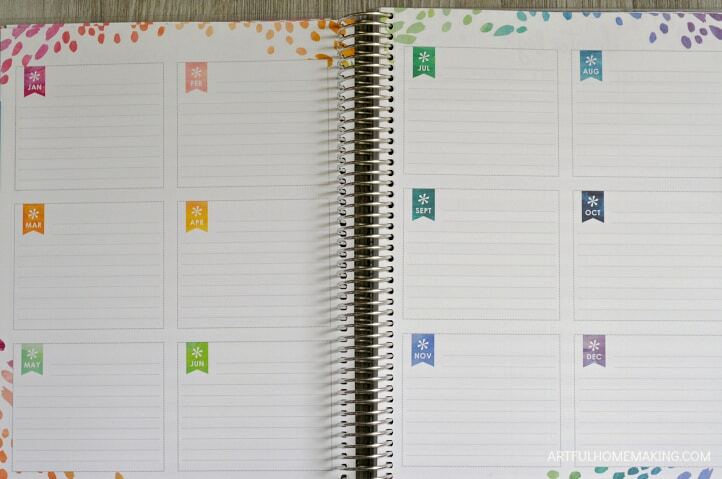 The planner comes with these colorful date dot stickers to fill in your monthly calendar pages. The page below is for January, which I just wanted to show you because I think it’s beautiful (love the quote!). 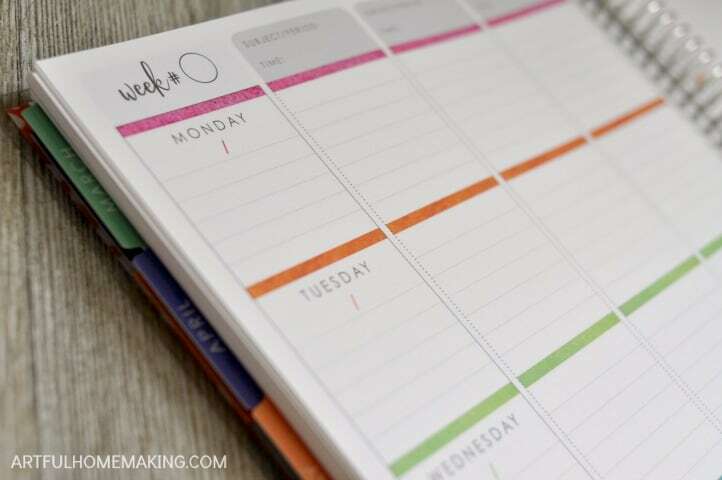 This year the page preceding each calendar section has been improved with the four little circles at the top, which would be great for highlighting four goals for each month. Then there’s a section of lined paper to list whatever would be helpful, and then dates to remember and a section for birthdays. After the calendar pages there’s a section full of lesson planning pages. And this year you get 40 pages for your planning needs! Last year I was able to plan for all 5 of my children plus Morning Time all on these planner pages. It worked out really well for us. I color code my children using these pens (and these), and that helps. The final section after the lesson planning pages is the section of student checklists. At first glance these may not seem like they would be very useful, but they really are! I’m planning to use them for attendance tracking and chore checklists. 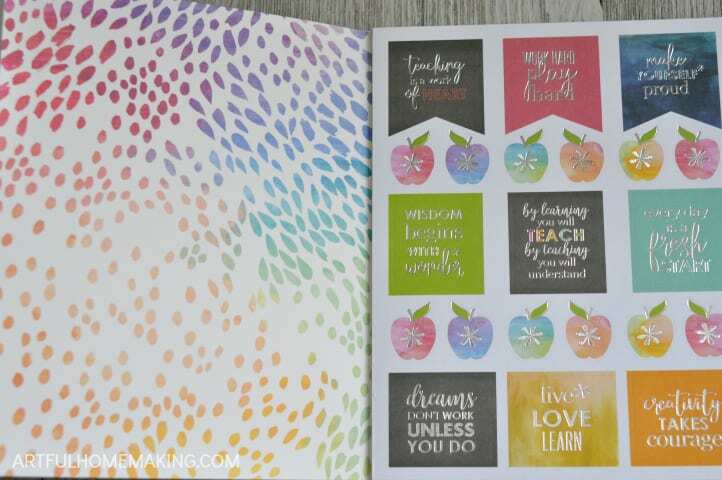 This year I am just blown away by the stickers included with the planner. They are so beautiful! You get four full sheets of stickers, including two sheets of blank ones, to include whatever you’d like them to say. Some of the stickers won’t be useful for homeschoolers, but there are so many that will work perfectly! Like last year, I again ordered the Cool for School Stickers. This year they are more beautiful than ever. I especially love the watercolor apples. After the pages of stickers, there’s a very useful pocket to store things in, and then you get sheet protectors! I love these. 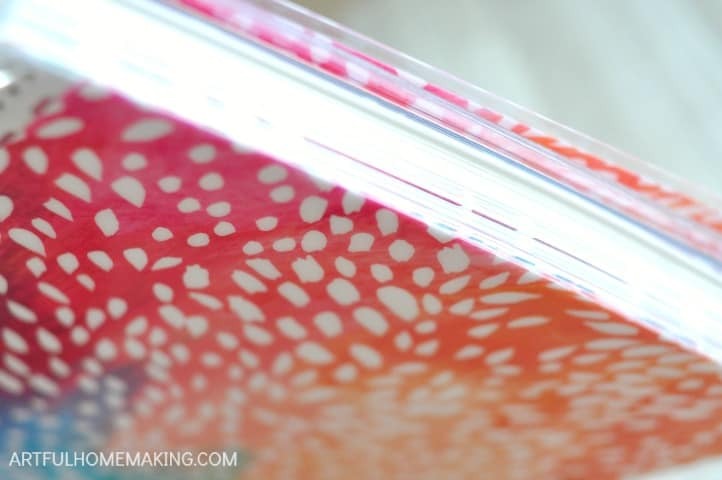 They’re great for keeping memory work, schedules, or other school papers handy and protected. The back of the planner includes a laminated back cover that you can write on, just like the front cover. 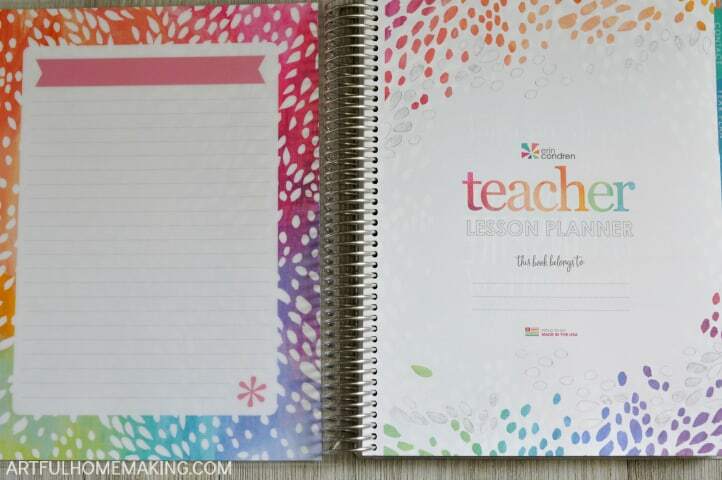 In my 15 years of homeschooling, I’ve been through a lot of lesson planners. Some were very inexpensive but functional, some boasted the ability to track large numbers of children, and some were just basic planners. 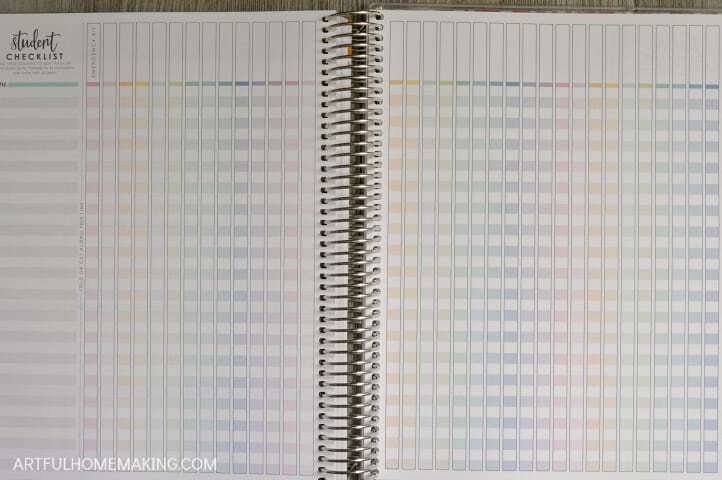 But out of all the various planners I’ve tried, there was one thing they all had in common: They were all unattractive in design (and therefore, I didn’t enjoy using them). I don’t know about you, but I believe beauty matters. That’s not to say it’s the only thing that matters. My preference is a mixture of both form and function. 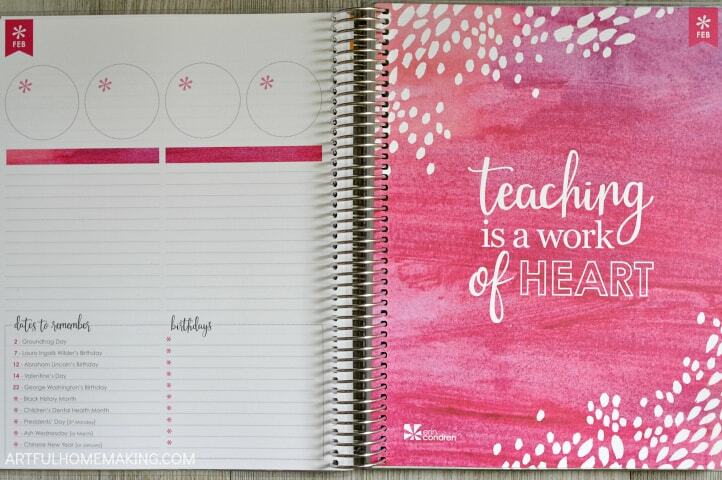 The wonderful thing about Erin Condren Teacher Lesson Planners is that they’re both beautiful and functional. 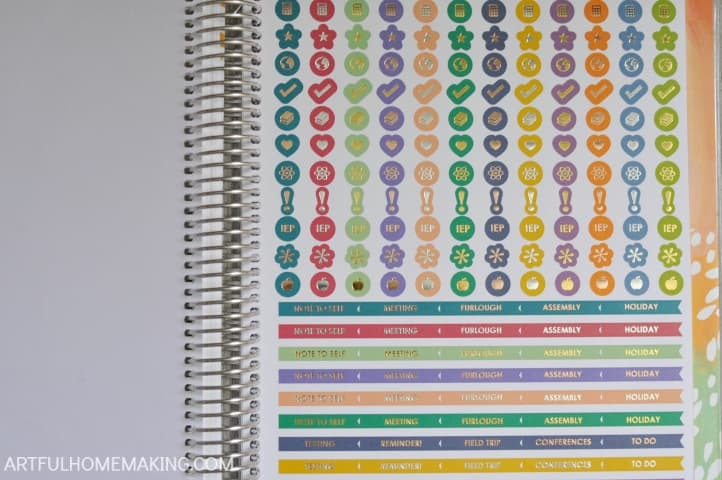 So, even though it may seem like a pain to have to modify some of the pages in the Erin Condren planners, I (and many other homeschool moms) feel like it’s well worth the trouble. 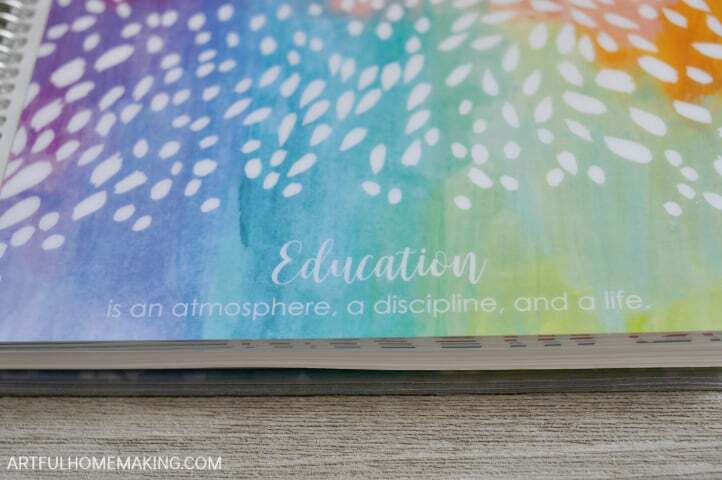 Do I wish they would come out with a dedicated homeschool planner? Of course! Although I would probably still find things to change up a bit to work best for our unique family. 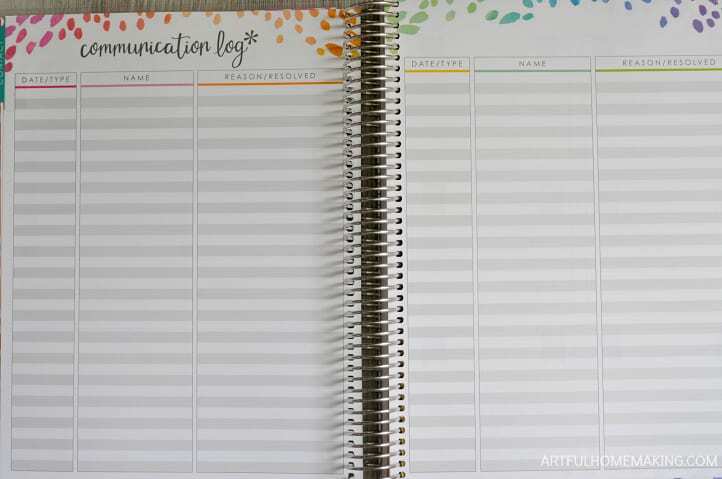 Another thing about the Erin Condren planners that I like is that there isn’t a lot of unnecessary commentary in them. All of the homeschool planners I’ve used in the past have way too many words for my liking. I love just having a blank slate to add my own words and plans. I was so excited when I got my planner that I made an unboxing video! 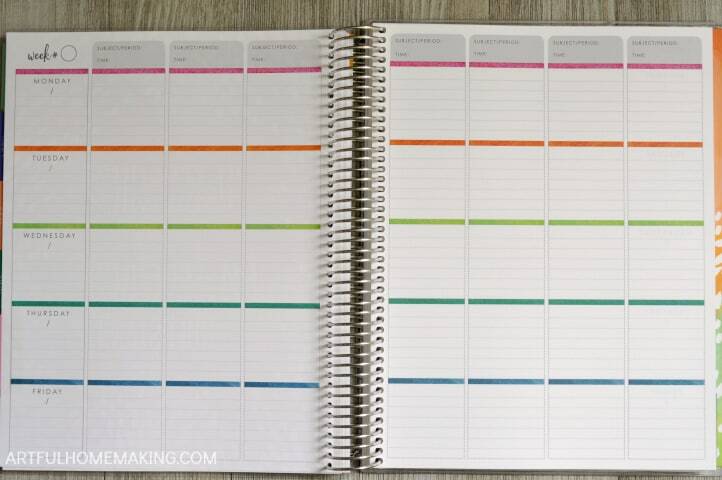 It’s kind of long, but if you’d like a sort of in-person view of the planner, maybe it would be helpful! 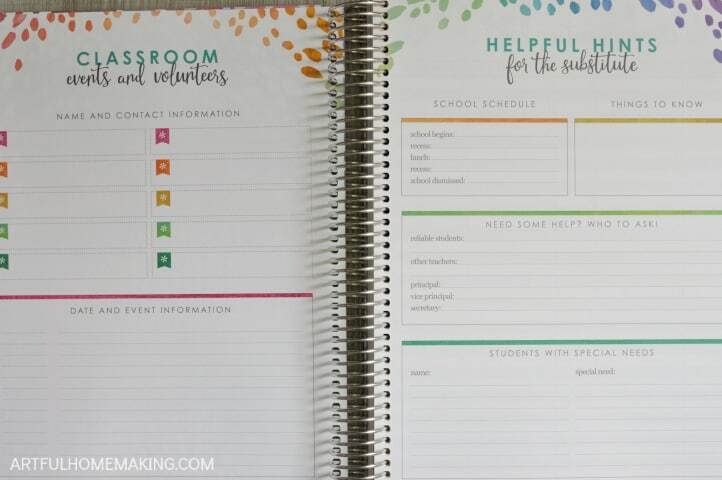 Stay tuned for an update post featuring my modified and customized homeschool planner. I’ve got my planner completely customized for our family and I’m loving it. I’m so excited about the changes I made that I can’t wait to share them with you! 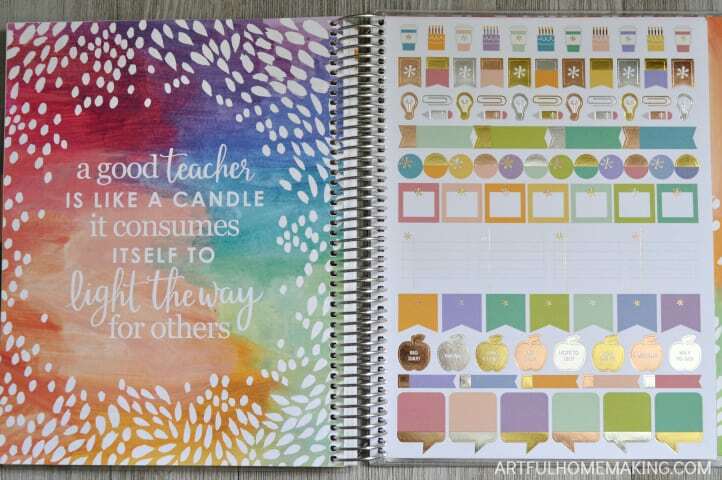 My refashioned Erin Condren Homeschool Teacher Lesson Planner is already proving very useful as I make plans for the coming school year. 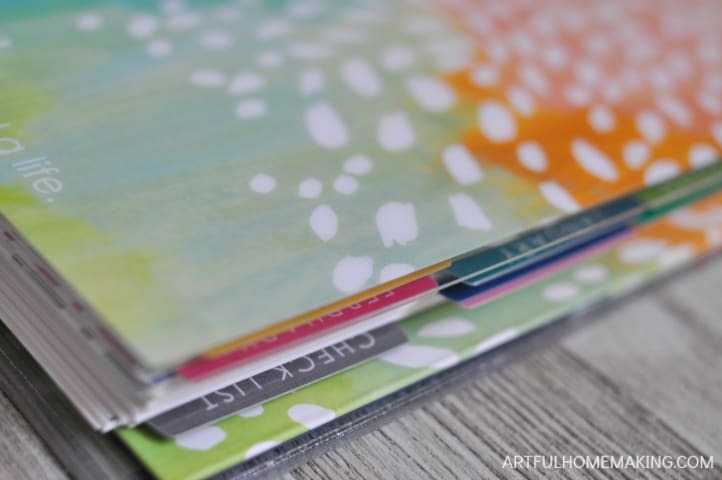 Remember, if you’re new to Erin Condren, you can get a coupon for $10 off your first order when you click through my referral link here. I’ve used Well Planned Day for six or seven years, but with only two homeschool students now, I think I need to try something different. I’ve been praying for you (just this morning in fact)!